Wheelchair incline stair lift that can be wall or stanchion post mounted to almost any staircase. With the standard or a special size platform the stair lift can be adapted to fit the majority of applications which include stairs with mid landings and the requirement for the unit to travel around a corner or bend. With simple and easy to use push buttons and joystick, the stair lift is a reliable and cost effective solution to restricted access via an existing stair case. 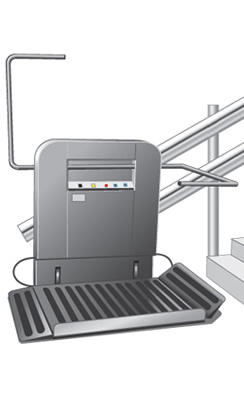 To operate the stair lift unit, the wheelchair users would press the unfold button on the remote control station and the platform will then automatically unfold ready to be used. The wheelchair users can then move themselves onto the platform. Wall or stanchion post mounted. Automatic fold and unfold facility. Single phase, 13 A power requirement. Capable of accommodating stairs with mid landings or curves/ corners on the staircase. 237 mm (350 mm when stanchion post mounted). Platform side panel: RAL 9007. Floor and ramp covering: Non-slip flooring, RAL 9007. Through or adjacent entrance configuration. Rack and pinion with worm gear motor and brake. Comfortable and easily accessible push buttons. Key switching provided for upper/lower call stations. Safety arms located behind the platform when folded. Key control: Key switches provided on both landings. Safety edges: Sensitive edges are provided for the highest possible safety. Safety gear: Fall protection provided by speed governor and safety gear. 240 V, 50 Hz, 10 A supply with soft start and stop, 24 V control voltage.